Our product range includes a wide range of aviation light for helipad, led semi flush aviation light for helipad, led flood light for helipad and led strobe light for helipad. §The SYSTEM APPROACH was derived from the fact that all aircraft, whether fixed wing or helicopter, once airborne, must have a place to land. All airport lighting systems are integrated and involve hundreds of different lighting fixtures, each type being important to the whole system. §The Downing Heliport Lighting System is a complete, comprehensive, coordinated, and Innovative lighting system, specially designed with the helicopter operator in mind. All of the visual aids in the Downing Heliport Lighting System work independently and together to make landing a helicopter at night as safe as landing it in the daylight. All of your heliport needs – from a single source. §Aluminium treated drop-forged dome and cast aluminium lower cover. §Omnidirectional 8” dia. §The lens is mechanically clamped to the dome by means of a fastening ring; a customized lens gasket avoids the use of sealing. Replacement is quick and easy. §No water builds up in front of the lens. §No optical adjustment is required after the replacement of the lamp, filter or lenses. 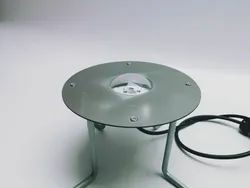 §An O-ring placed outside around the dome avoids dirt deposits between light unit and mounting assembly. §The removal of the fixture is easy thanks to the two seats provided on the dome. 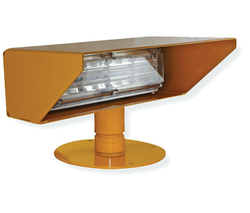 LED floodlight has been specifically designed for helipads to provide uniform surface lighting where the TLOF and FATO lights need to be supplemented with floodlighting. LED based solution to the ICAO touchdown and lift-off area perimeter floodlights. Housed in a weatherproof, powder-coated aluminium enclosure to withstand the harshest of environments. 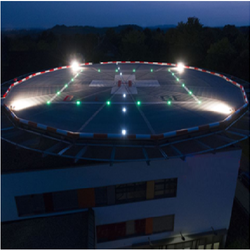 The LED optic is specifically designed for helipad operations, and distributes the light evenly across the wide helipad surface. The angle of tilt of the LED luminary can be easily adjusted to focus the light on the helipad to maximize illumination. The hood further prevents potential glare to pilots upon approach. The Surface Floodlight is specially designed for helicopter landings and refelcts the surface, whether it is plain concrete or painted with reflectorized paint. The floodlight with flushlight is installed slightly above the surface level, equally spaced around the heliport. Uniform lighting is achieved for landing and loading activities. 1.long-range and clear visual guidance is considered necessary; 2.Identification of the heliport is difficult due to surrounding lights. Looking for HELIPAD LIGHTS ?